This excellent work connects all the dots. It draws the reader closer to the Almighty, to the Torah, and to the Land of Israel. Does this Bible have the New Testament? Through reading The Israel Bible, I gain a deeper understanding through inspiring Jewish insight, which has always connected the Bible to the people, land, and God of Israel. Thank you, Rabbi Tuly Weisz for allowing non-Jews the opportunity to connect as well. 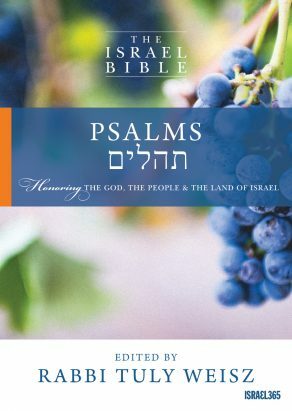 Israel and the Land of Israel and this is precisely what Rabbi Tuly Weisz has succeeded in doing in this timely translation of the Bible. The Bible, the land, and the people of Israel are one, and The Israel Bible reminds us of this bond. You can’t read the Bible, the word of God, without understanding the significance of Israel—past, present, and future. In 1948, the prophecy came to pass in our own time and no one can disconnect the people from their land ever again. Now that the God and people and land of Israel are back together, history is happening here. Jews and Christians share a biblical heritage, and The Israel Bible shows even more clearly that this is the land God chose for the Jewish people. The Israel Bible helps you understand that the whole Bible is all about the Land of Israel – and that is a message for all of humanity. The Israel Bible is a treasure of a translation. But it’s more than that – beautifully illustrated, with rich cultural context. It will aid your study of Scripture as few English translations because of its authentic Israel-centrism. It’s a breakthrough for those seeking a fuller, deeper comprehension of what HaShem is is still speaking to us today. The Israel Bible is a teaching tool to help prepare the nations for when Jerusalem will be the worship capital of the world, and Israel with its Hebrew language will be center stage of universal blessings. Who contributed to the “Commentary”? How much of it is “classical” (based — e.g., upon commentaries such as Rashi, RaDaK, Metzudos, MalBim, and how much is more “modern”? And, who are the “modern” contributors to the commentary? I am truly blessed to have this beautiful Bible. Thank you. What is the difference between the hardcover version and the complete version? J’aimerai acheter cette Bible commemorative,mais la traduction Hebreux Français est-elle possible? It’s time for Christians and Jews to unite! Echad, blessed be Him! 5 out of 5	This Bible is a Blessing! I am so excited that the importance of the Land of Israel, God’s chosen people and God are now officially highlighted in the most important book ever published.